Serious show of hands: when you make a page, does it go in a stack with other pages or in an album? Because I really want to talk albums. Like honest truth about albums. 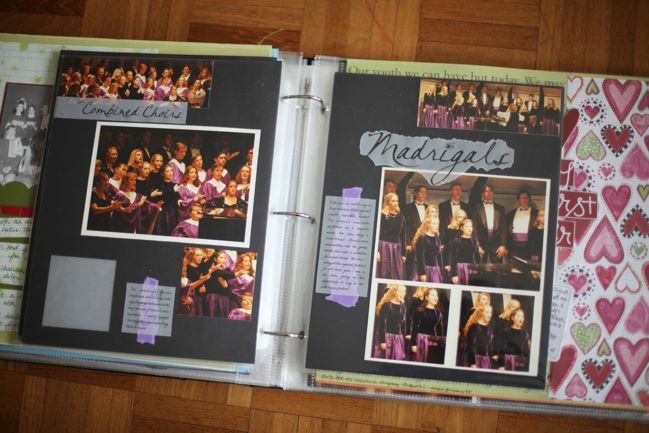 I’ve talked about my personal album process before – for a long time, my pages were in quite a mess. Some in albums, some not. Some in order, some not. I’ll be honest: when I was creating more than half my pages for books and magazines, it was hard to figure out how to keep pages organised because I wasn’t particularly amazing at keeping an inventory of what I had made and sent away to the publishers, so I had no accurate idea of my page inventory, so to speak. At that point, if you had asked to see an album, I would have gone straight to a Christmas journal, because those albums are made in order and kept in order and no matter which day marks the end of the project, there is always some sort of finished feel to that journal. It’s real and it’s readable from start to finish and I love how it’s cohesive without being repetitive. But that was then. Now the majority of my pages are photographed here rather than sent away, so I don’t need a complicated spread sheet to remember the pages I’ve created. I set up an album system, I moved my albums to a place where they would be easy to reach every day, and truly if you walked into my flat and asked to see an album, I would point you to the shelf and let you pick any book that’s there. Because I am truly happy with each of them in their current state. Aside from annual Christmas journals, none of them are in an officially ‘complete’ state. As far as I can tell, they never will be. I like that I can go back and add more at any time, but I also like that there’s nothing that works out as a project that can’t be seen because it’s unfinished. You know those projects? I have minibooks like that – the pages all covered, and then only the first half completed – that sort of thing. But in my 12×12 albums, you wouldn’t really know there was a gap – you just wouldn’t be able to read what happened between page a and page b, because I haven’t added anything there yet. Truly the system I use for my albums is totally beside the point – I don’t mean you have to follow the same system I use in order to be happy with your albums. You don’t. Not in the slightest. But the last few times I’ve written about albums, several people have come out of hiding to say they have scrapbooked for years and don’t actually have a single album. Their pages live in stacks or in drawers or in boxes, and once they are completed, they don’t really see the light of day again. And not in an I’m meaning to put them in albums when I get a minute way, but in an I don’t really feel any need to ever look at them again way. If I’m being honest, I read those comments and my face dropped. 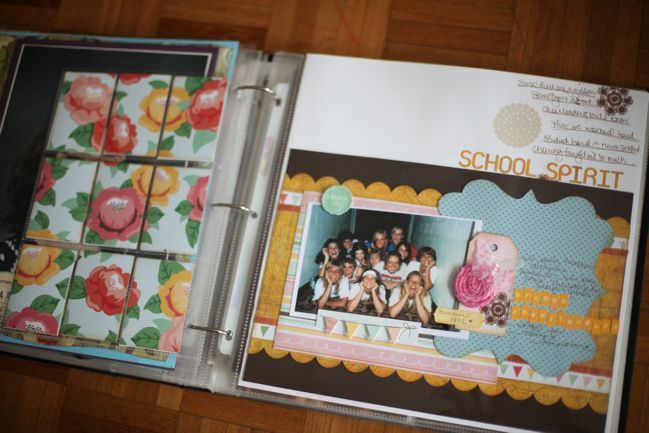 Yes, making a scrapbook page is this creative, enjoyable experience in and of itself. I love that our craft is one that can offer real results in a short amount of time. 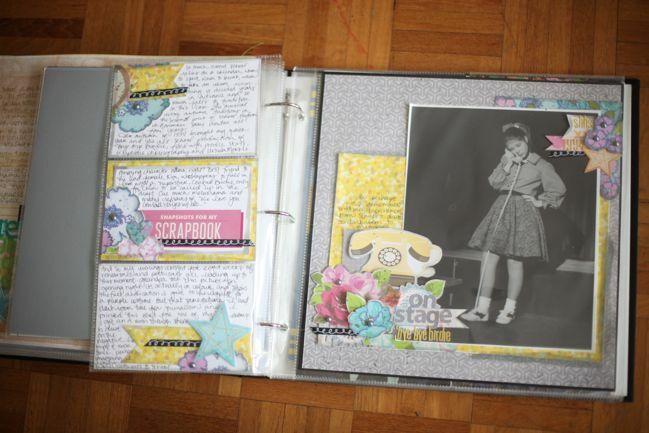 I don’t think I would enjoy scrapbooking quite as much if it took weeks or months to make one single page. (This is why I have never knit a pair of socks, for I am convinced I would give up before I turned the heel.) So yes, I love that we make pages and enjoy making them. But albums are this whole other level, just waiting to be discovered. Once you come up with the way you want to organise your pages in albums, looking through an album gives you a new plane of creativity. A new way to write, when you keep the longer format in mind. A new way to embellish, when you consider what pages you have already created on related topics. A new way to get the most from your supplies by looking at a range of pages rather than a single page. If you really don’t have any desire to look back at your pages in an album, then I respect that. It doesn’t work for me. If you mean to put pages in an album but just keep putting it off, I really recommend taking a couple days and just making it happen. It doesn’t need to be perfect and it doesn’t need to be complex and calculated. Just find a way to let your pages be enjoyed after you make them, that’s all. I don’t love this instead of making each page at a time. I love this as an addition. Like creative step one: make a page. 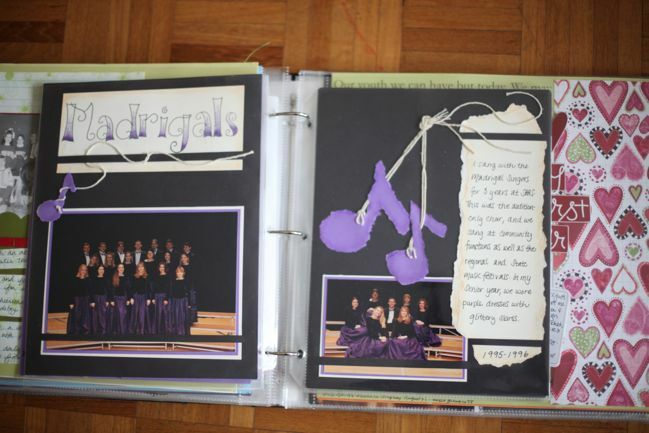 Creative step two: look at how that page affects the album. Sometimes the album itself inspires my next page. Sometimes the next page comes completely on its own and making it a smooth transition in the album becomes its own creative challenge. That may sound a bit esoteric, but what I really mean is albums now make me more excited about scrapbooking than I have ever been. And here’s a big bonus: if someone who doesn’t understand scrapbooking asks to see what I mean, I can show them an album that will make sense without needing to know about the crafty stuff. The story makes sense as you flip from page to page. I can still make every page as embellished as I want, with products I like and in whatever style makes me happy. Every time I finish a page, I love seeing how the album itself is coming together and it makes me relive the memories and think of more things I want to write in my very own words with my very own pen in my very own hand. So in short, to me, albums are good. Looking at pages again and again is good. Enjoying both the single page process and the long game of curating all these individual moments into the full autobiography is definitely, definitely good. 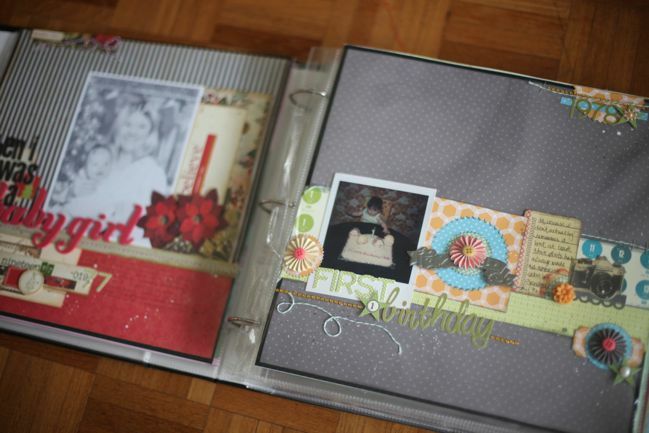 This month marks my thirteenth year of scrapbooking and I’ve never been happier to call myself a scrapbooker. But if the short version isn’t enough, I’m teaching a workshop on this very principle of making albums take on that whole new level. It’s called Go with the Flow and it’s part of True Scrap 2. My class is live tomorrow (Thursday) at 7pm UK time/2pm Eastern time. But at True Scrap, there are also sixteen more workshops from instructors like Nichol Magouirk, Kristina Werner, Jennifer McGuire, Noell Hyman, May Flaum, Kelli Crowe and on and on. 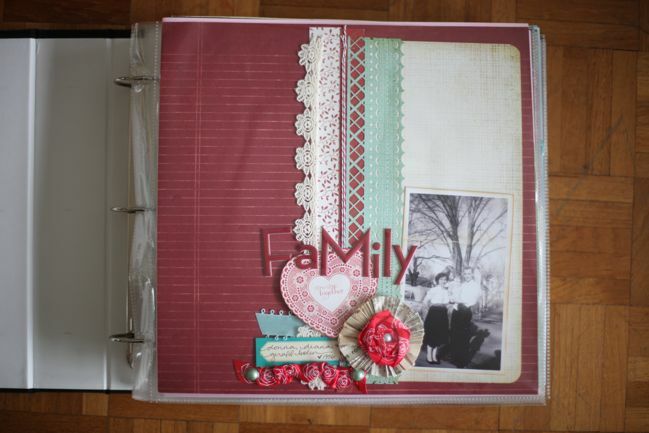 We’ve all selected topics on our very own scrapbooking passion, so everyone is sharing something they truly love. True Scrap works like this: you sign up and have access to the whole event – both live and recorded. So if you can make the live sessions Thursday, Friday and Saturday, then you can ask questions of any instructor and chat with everyone. If you can’t make the live sessions (or you can only make some of them), that’s okay too because you get access to the recordings and you can watch them (and rewatch them!) in your own time. Each class is presented by video and followed by a Q&A session where you can type in your questions for the instructor and she’ll be there live to answer. The classes include a mix of techniques and philosophies – some things you can actually make right along with the video, others encourage you to think and process an idea and then make it work for you over the long run. So yes, it starts tomorrow, but you can still sign up. You can find all the details here. If you do sign up, I hope to see you tomorrow night when we’ll be talking albums! And it’s concrete album discussion. Things you can follow and use, less of the idealistic I! Love! Albums!, I promise. And if True Scrap is not for you, I’m sorry to miss you – but we can still discuss how fabulous this hobby is. Any time. I’m going to stop gushing now and close this post, but some days I am just extra, extra happy to make things and glue things and write things. Today is one of those days. 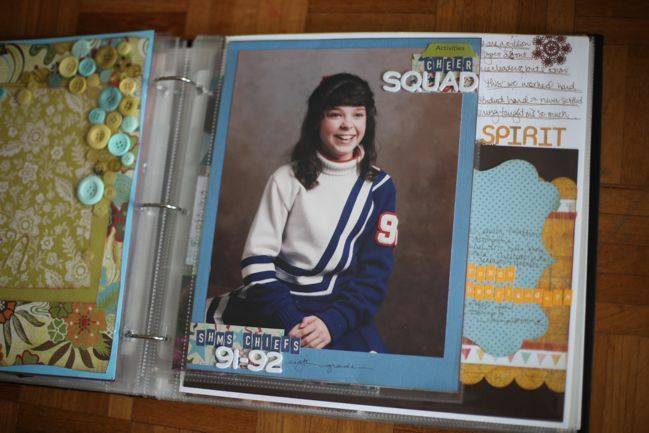 Sending much happiness to you and your scrapbooks! After the discussion of albums in two recent posts (here and here), this particular album became the topic of several discussions over the past week. 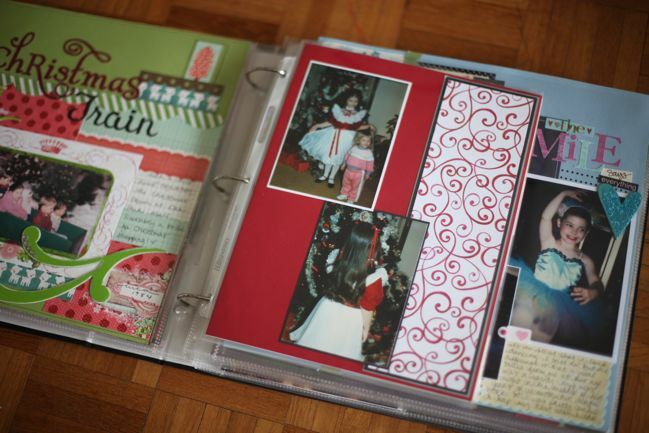 I’ve said I don’t create in chronological order but I do store my pages in chronological order in albums, and that I have yearly albums (and often multiple volumes per year) for my scrapbooks from the year 2004 to the present. But what about older photos that predate 2004? And how does it affect the look of an album if the pages are created many years apart? I do keep pages that predate 2004 in chronological order, in an album titled ‘The Early Years’. It’s certainly not everything pre-2004, but rather some highlights from growing up. Some pages are very new, others are ten (or more) years old. I haven’t added all of my old pages here nor is it the only album that has pre-2004 photos, but it is an album I’m happy to share with anyone who would want to have a look at something other than our yearly albums. I’m actually at the point where I’m going to split this album into two volumes, so before I added half of these pages to their new home, I photographed the whole album in order so you can see how it all ends up together. Heads up: there are a lot of photos in this post! You can also scroll down to the end for the answers to questions that came up in the comments. 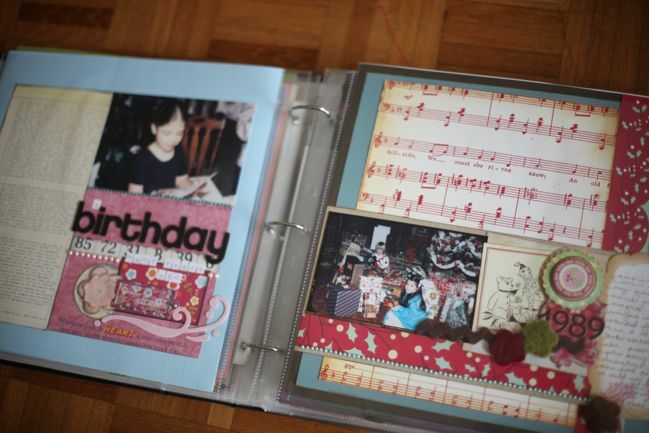 These two pages are recently created, but old photos – my first Christmas and first birthday. The photo on the left page was scanned and I printed it in black and white on my home printer. The photo on the right is an actual old Polaroid. The page on the left is recently created, with an original print (rounded corners and all!) from 1980. 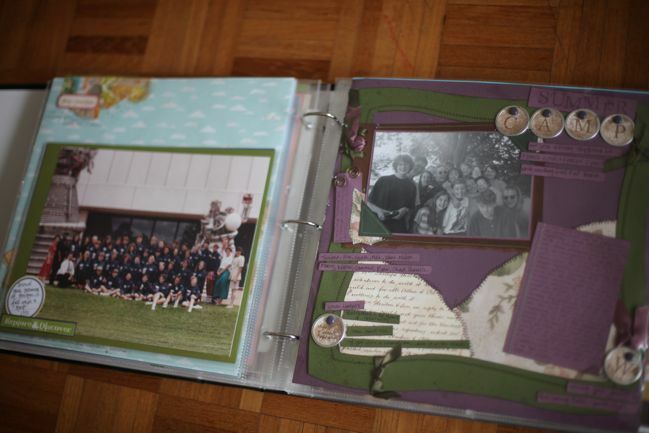 The page on the right I made in 2008, and that photo was printed on my home printer from a disc of scanned family pictures. 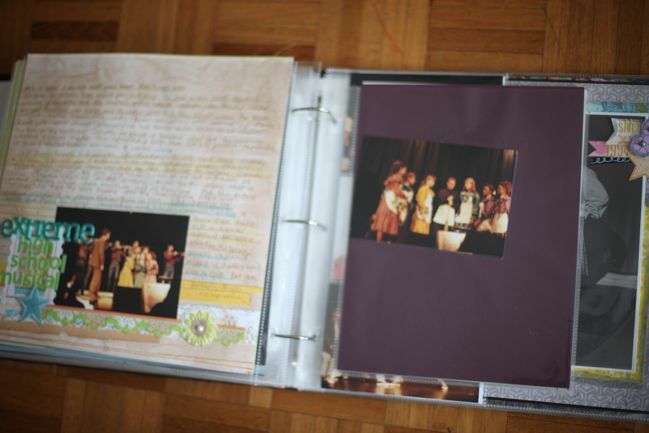 The 12×12 page on the left I made in 2008. The page on the right is a bit of an oddball – it’s 8.5×11 and part of a two page spread but I have somehow misplaced the facing page! This is a much older layout – I made this is about 1999 I should think. These are actual prints and I created these pages for an article in Creating Keepsakes in 2000 or 2001. These are some of the only pages from that point in time that I still actually like – but I think it’s because I did this in my own handwriting and so many of my layouts at that point had all the words printed on the computer. I’m not a huge fan of that element of my older pages. In this case, the title is hand-lettered too, then I handstitched each letter in a different colour and the letters are on pop-dots – so there are several things evident on this older layout that have come through to my current style. Here I ended up with an awkward pairing so added something to fill the gap. The previous pages are 8.5×11 but I also have a 12×12 page with the same photos. So I added a very simple page that is mostly one photo to fill that empty 8.5×11 space in between. That picture was originally much smaller, and then it was scanned and ended up on that same disc of family pictures. I printed it at A4 on my home printer, and although it’s not as sharp as the original, it’s just fine. Something else to note – when I created the 12×12 page on the right, I had already scrapped the originals on the previous layout, but I needed those pictures for an assignment. So I photographed the layout, cropped down to the pictures and printed them that way. Worked just fine, and even the large photo printed on the transparency actually came from a photo of the layout. This page was made in 2009, I think? It was for an article in Scrapbook Inspirations. These layouts were both made in 2009 with photos printed at home. I’ve realised this week that the date on the right hand page is definitely out – I had guessed but now I think it is more like 1986 than 1989! So perhaps I can just turn the sticker upside down? They weren’t made at the same time and weren’t planned to go together or anything – they just ended up there by way of chronological order. The page on the right became a sketch challenge for UKScrappers, with a free template to download here. …and this was our full crew in my second year. In NASA jackets. Next to various rocket parts. So those are just attached to 8.5×11 cardstock and there’s a journaling spot to name and date them, but the rest of that entire adventure is on the to-do list. Then back to 12×12 on the right, with an older layout. The photo is from 1993 and I made the page in 2003. The picture was in colour but I had it reprinted in black and white from the negative because the colour was pretty washed out anyway. It was taken on my instamatic so not exactly the height of photographic technology. 12×12 on the left, with a layout I made in 2007 and on the right, and 8.5×11 page to hold an 8×10 picture from middle school. This had just been sitting in the page protector, so a few weeks ago I added just that little bit of embellishment with some leftovers from another page. 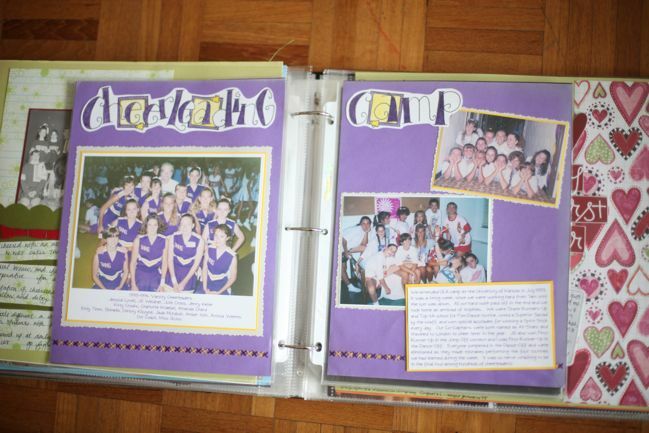 I have scrapbooked quite a few pages about cheerleading in high school but nothing other than this about middle school – mostly because I don’t have anything other than the formal photos (and they are pretty cheesy). This one makes me laugh so very much. The picture on the left is my school photo from my first year of high school – the autumn of 1992. Now actually that means this picture is out of chronological order, because the pictures on the right are from August of 1992, but I wanted them to be side by side like this so forgive the calendar confusion just this once. It’s the Glamour Shots that make me laugh. Apparently Glamour Shots still exists? And they have changed their game a little now. But in the early 90s, they had a very strict formula: they would make your hair as big as possible and add tons of make-up (no matter what your age) then photograph you in soft focus with these crazy outfits that no one would ever wear in public. In fact, the outfits were so crazy and the hair was so big you couldn’t wear them like regular clothes. You wore a tube top and they draped clothes over you, so it was either jackets or wraps in every single picture. That pink thing that looks like a prom dress was really just sparkly fabric that they kept wrapping around me then two big baubles they tied to my arms. The end result was everyone they photographed seemed to become the same age! So those pictures were taken one month before the school picture (with significantly less make up and hairspray). I don’t really have any amazing story other than thinking these photos are funny. 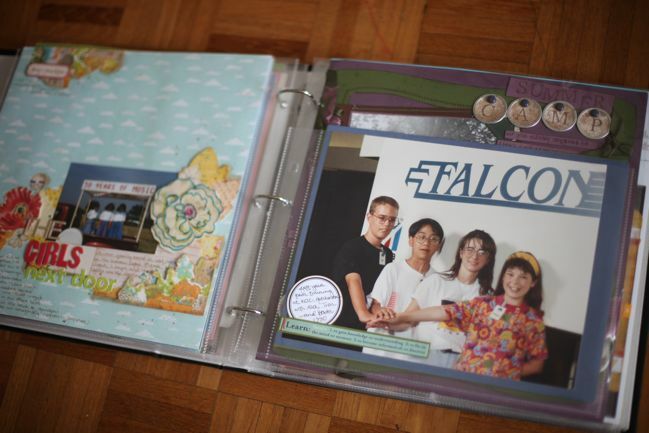 That page protector is from the Pink Paislee portfolio album (and the holes fit in the 12×12 book just fine). This is the point where this album will be broken into two volumes – I have more high school stuff than earlier, so the beginning of high school is a good break to separate the pages and have the freedom to add more to the story. At the moment I don’t have any other small photos to fill the back of that page protector, so I just cut a piece of patterned paper to fit and chose something that would coordinate with the page on the right, which I made last year. Much older page on the left – and a page I don’t love. This was a photo from our high school yearbook and I managed to salvage the original print when they came back the following year. But apparently I was in a quite minimalist phase when I made this page (2006, I think) as there’s not even a title. At some point I think I will rework this page. 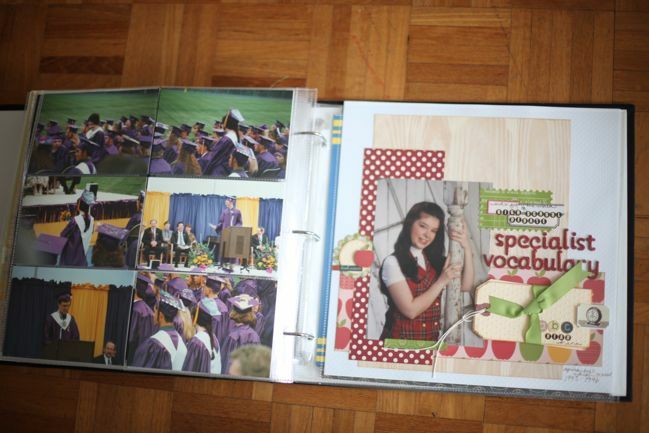 And the page protector on the right is something a little different – I photographed the cheerleading spread from my high school yearbook, including all the notes we had written over those two pages, and just printed it at A4 and cropped it to add to an 8.5×11 sheet of cardstock. No real scrapbooking elements but a lot of storytelling. Oh hello there, old pages! These were for an assignment with PaperKuts magazine in 2001 with pictures from 1993. I had these reprinted from the negatives (and they are from that same instamatic that didn’t do so well with colour). Hand-lettering in the title but everything else is typed and printed, which I don’t love. But I do love that I still had a notebook with all my bits and pieces from this point in life so I had written various factoids about camp and the prizes we won, routines we performed and so on. The deckle scissors really date this, but I don’t think I will rework this page. Though the cardstock on this is really fading (it is not nearly the quality we have available today), especially at the far right. Again, old pages here – made around 2001, for an article on how to tear paper! Amazing, I’m sure. These photos are of my school’s version of glee club. We didn’t have nearly as many amazing costumes as they do on television! More singing pictures from the same time frame, but awkward in that I ended up with an empty page, so I’ve just added a sheet of plain black cardstock there for now. 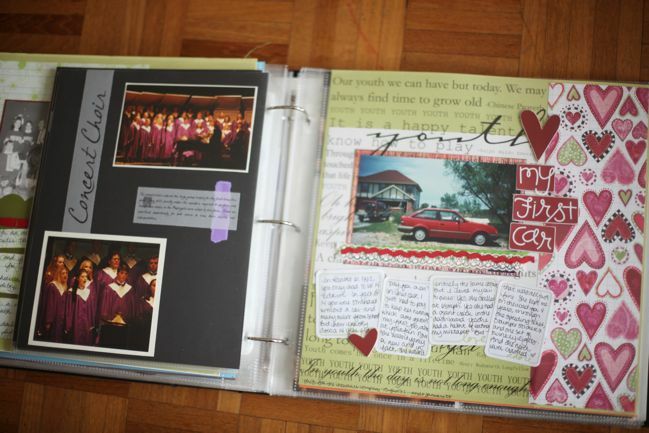 I’m planning to fill that with journaling and glee-filled memories of our high school choir, as I didn’t really write much on these older pages. Also, gotta love the trendy vellum. This window effect was for an article on multi-page layouts, I think. …and it finally concludes. Then back to 12×12 on the right, with a page about my first car. Very different styles from the left to the right, and I do have photos that fall between these two in dates, so maybe that will help to bridge the styles. But I don’t really mind too much. I think I made this layout around 2006. By the way – for a long time I thought I didn’t have any photos of my first car for some reason. Then we realised there were quite a few, as we had to photograph it from several angles for the car insurance policy! Handy tip if you’re looking for old pictures that might be in your household records rather than your photo files. …are also from that. But made many years ago! This layout was part of my hall of fame entry in 2001. And then a big gap, really! 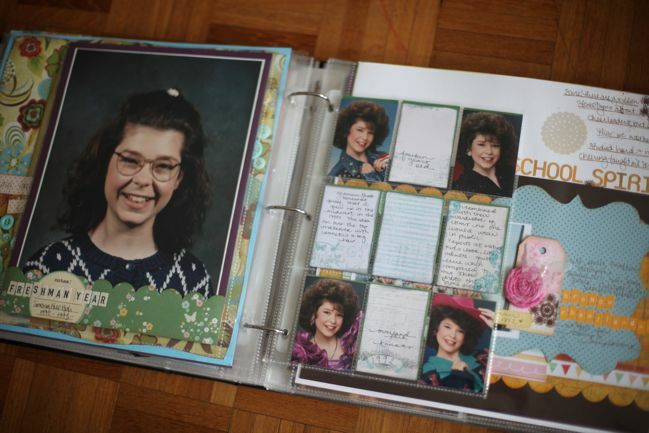 Nothing but plain cardstock on the left, and a couple photos plus a journaling card on the right but they aren’t really scrapbooked – they are just added here because it’s the right spot in the timeline. I actually have several layouts about those photos, but they are in a much older album that I don’t have out on display right now. I came across these two photos and put them here as a reminder to go through that particular older album and pull out what I would like to include here. Some of those pages will be things I don’t want to include – lots of photos cut into shapes with no journaling. But others will be more in keeping with the narrative, even though I know they are all very minimal, all in red and black and all have typed journaling. That’s okay. 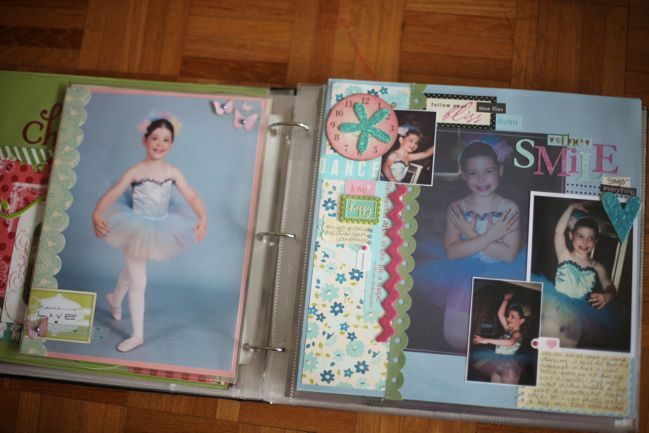 This very recent layout with the additional journaling in a 6×12 photo protector, which I wrote about last week. 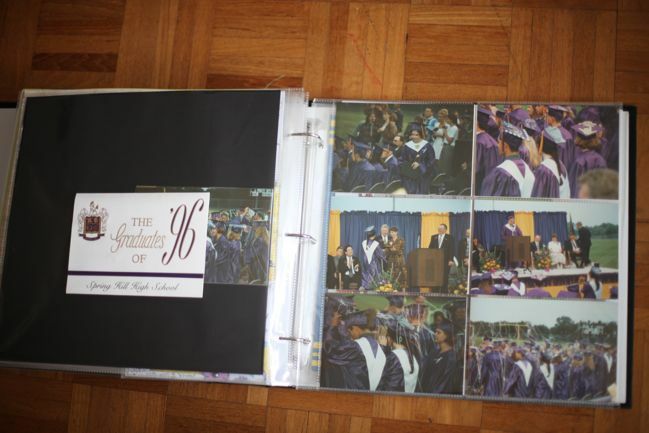 Pages that really aren’t done at all – but I had fourteen 4×6 photos from my high school graduation, so I added them all to a photo protector for now and included my graduation announcement here too, but I haven’t done anything else creative with these just yet. And one last layout here that I made last summer about all the strange phrases and abbreviations used in high school debate. This one is out of sorts with the timeline and I need to find a good place for it to go – but it’s not from a specific date and debate was something that was part of my entire four years in high school (and actually university too) so it’s not one that is easy to pick a date. Don’t albums cost so much that it’s hard to keep up with lots of layouts? As albums are a higher priced item, I take advantage of sales and stock up whenever there is a good price. Two Peas has run the black album at 50% off at times and the red albums have been on sale lately too. If you’re really short of albums compared to your stack of homeless albums, count up your pages and figure out how many albums you need and stock up when you can find a discount – that would be my best advice! I love that albums make it easy to look back at the pages and the stories, and definitely think albums are worth the investment for keeping pages secure and shareable. I also automatically buy a second pack of page protectors to add to an album whenever possible, so I start with twenty instead of ten. I try not to have more than twenty 12×12 page protectors in one album (though my pages are often quite bulky, so more could fit with flat pages). Why do you prefer 3-ring over postbound albums? A little background – I started with ring binders way back at the beginning and then I moved over to postbound albums when I started making 12×12 pages. For about four years, everything was postbound and I saved up for fancy fabric-covered albums that were £30 to £40, because that was what was available. At first, I thought they were great quality and I added the extender posts to make the most of each album. But by the end of those four years, I was disenchanted as the expensive albums fell apart, and I found it so difficult to arrange the pages since taking one page protector out meant taking the spine apart. So although some pages might look prettier without the rings in the middle, I’ve just had much better luck with making ring binders work for me. The ring binders available today are much higher quality than the first few I bought way back in the late 90s and I just find they are the best solution for the way I scrapbook. 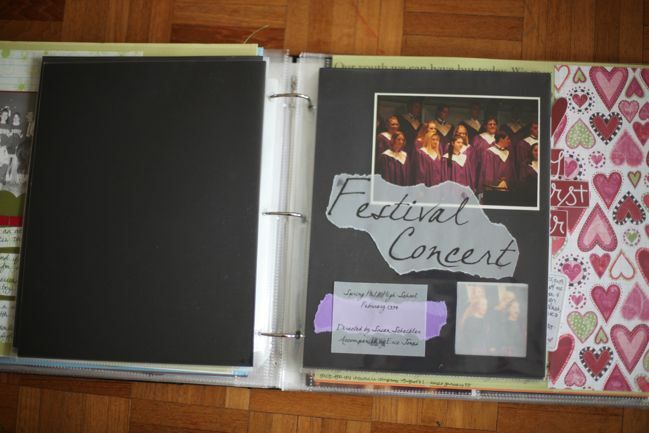 Are there any 3-ring binder albums that don’t require page protectors? Well, yes and no. Binders usually come with page protectors and it’s assumed you’ll put your pages in protectors. But the rings in a 3-ring binder are a standard dimension and in the US you can buy a three-hole punch used for adding pages to notebooks (like at school). If you don’t like page protectors I don’t see why you would have to use them when you could use a three-hole punch with cardstock or chipboard to make your pages instead. Or you could cut your own paper from large sheets down to 12×13 or so to add a margin to the centre edge and punch the holes there? I definitely like page protectors, so I hadn’t really thought of it before you asked! How do you deal with two page layouts in a 3-ring binder? Isn’t it hard to read if the title or journaling goes across the join of the two pages? It depends on the layout. Sometimes it just doesn’t bother me at all. Other times it can be hard to read, so I’ll sew two page protectors together so the pages don’t separate when the page is turned. If you don’t sew, you could use double-sided tape to attach the page protectors. How many albums do you have? And how are they stored? Where did you get the metal-edged circle tags? Metal-edged circle tags are tremendously easy to find in the US, as they are stocked in most office-supply stores. In the UK, not so much. There are a few shops that import the Avery office tags but put a ridiculous price on them. 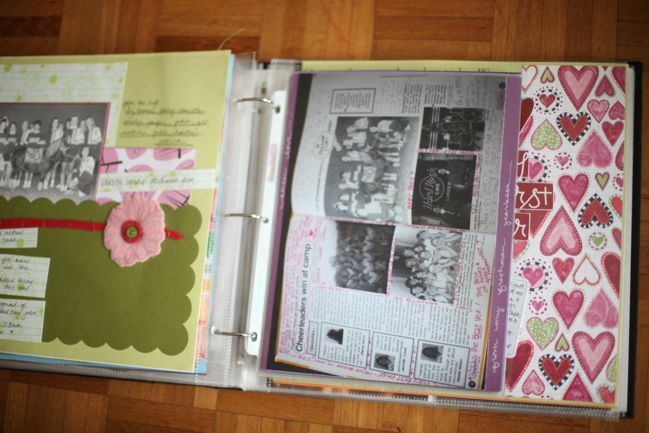 And for several years, Making Memories and EK Success sold them as a scrapbooking product. If you’re looking for them in the UK, it’s worth having a look at some of the older stores that may still have that in stock. Otherwise sweet-talk a friend who is visiting stateside if it’s something you don’t need immediately! Do other people suffer from the page protectors ‘falling out’ the bottom when the album’s not full yet? Do you mean the page protectors tend to hang at an angle? I’ve seen this in some albums at crops but I’ve never really experienced any trouble with it in my own albums. I store all my albums standing upright, so I would think there would be that extra pressure on the top hole of the page protector but everything seems to be holding up okay. What do you do with the thick pages? Most of the time, I just try not to face something really bulky against something it could damage – like no giant resin flowers pressed against a photo on the opposite page. There are always two full sheets of cardstock in each page protector (if I make a page on patterned paper, I will back it with cardstock when it goes in the album) so the pages themselves are quite sturdy. Occasionally if something is really problematic, I’ll add a chipboard page opposite and just cover that with a piece of patterned paper rather than a layout. And in the case of layouts on cardboard, like this one, I attach them to the outside of a page protector with a fair helping of super tacky double-sided tape. Who makes the divided page protectors and 6×12 page protectors? They are made by American Crafts, who do several types of divided page protectors they call photo protectors. The 6×12 protectors can be found here – look below on that page and you’ll see several other sizes, like the 10×12 and 12×12 options. How do you store your negatives? I’m afraid they aren’t very organised – just safe. They are kept in a metal photo filing box that seals and that lives tucked away in a cupboard. So they are dry and cool and out of any light. Once I open the box, they are all just in there and most of them came in sleeves from the developers, so I labelled those and although it’s not super organised, it is easy enough to find something usually! Have you scrapbooked older photos of The Boy? No. Not that I don’t want to – but more that he’s not really interested in that right now and I’d rather work on that when he feels there are stories to tell. If the timing is right, I think it would be a really fun project, actually. But for now, it’s just me. Album organisation is a topic that’s coming up in a few places recently, so if this has you thinking, you might also want to check out this post where Ali Edwards takes you through her daughter’s baby album or this post from Melissa Stinson, which collects several different scrapbookers’ album organisation processes into one place. I really don’t think there’s any one way to make album organisation work – it’s just a case of finding what makes you happy. For me, that has meant editing from hundreds of old layouts to finding the pages that really help tell the story and mixing the old and the new pages together, but telling the story in chronological order when you look at any particular album. That might not be the right system for you at all – but it is what I love. So thanks for making it this far through a marathon of a blog post about this particular album! Supplies include the Sweetly Smitten and Mix & Mend collections by Sassafras, grey patterned paper by Kesi-Art, pearls by Pebbles, stickers by American Crafts and yellow letters by Lily Bee. So much about school relies on a calendar. When to start, when to break, when to take an exam. Everything is decided years in advance and so much falls to tradition. In this case – the musical every autumn. Auditions in the second week of school. Performance in November. Same routine all four years. 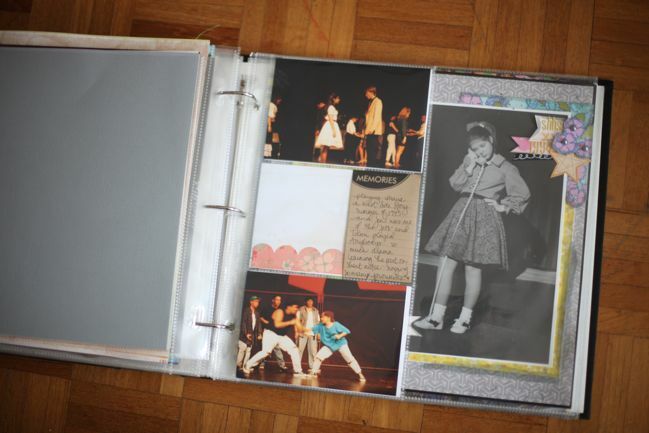 The autumn of 1994 brought my junior year and the all-school production of Bye-Bye Birdie, filled with poodle skirts, telephone choreography and Ursula Merkle. Amazing character name, right? Best friend to the lead female, Kim, who happens to fall in love with a superstar, Conrad Birdie, only for him to be called up in the draft. Cue much melodrama and many refrains of ‘We love you Conrad, oh yes we do…’. And so for eight weeks, my evenings subsisted of rehearsals and petticoats and saddle shoes, all leading up to this moment. Grandpa took this picture on opening night. It’s actually in colour and shows the full dedication I gave to the director’s request that I wear a purple costume. But that same autumn I had dark room time for journalism and I printed this shot for one of my exams. I got an A even though there is dust on the negative. I’ve kept it ever since… perhaps imagining I really wore petticoats to class in high school. Or perhaps just to remember that mix of excitement, from stage to photo to dark room to memory. One of the questions that came up from Sunday’s discussion on album organisation came from noticing that I said I keep albums on display from 2004 to the present. Where do I keep things that predate 2004? And this layout certainly qualifies as that – ten years before 2004 indeed! Photos like this certainly live in albums too, and this particular one is there in the same place with all the other binders. It’s a bit of a unique mix inside, so I’m going to share that in more detail later this week. If there is anything else you wanted to see or hear more about, just ask and I’ll try to make sure I answer everything so it all makes sense! But from this picture you can start to see what’s included here – varied page sizes, full pages and divided page protectors, and you might be able to tell that the layout to the far left is significantly older than this one. More on that Thursday. Yes, that is the original photo I printed in the dark room in high school – not a copy. But I have made a digital copy just in case and the negatives should still be in my negative file too. Just in case you’ve been worried with this crazy gluing of actual old polaroids and high school yearbook photos! I also just wanted to say how much I love these 6×12 photo protectors (by American Crafts) for adding more journaling. If you ever have a layout where you’re having to choose between embellishment and craftiness that you’re enjoying and a story you want to tell because there just isn’t room, these are the perfect answer. You can include even more journaling if you prefer to type on the 4×6 cards, of course, but it’s quite a bit of room even with a pen. Now, not too much making fun of me being known as Ursula for an entire term at school! PS: If you’ve ever been interested in guest blogging, the lovely Julie wrote about that today, and I promise guesting is not as scary as you might think! You know those projects you save for a rainy day? Well, it’s raining. And for some reason, I decided this was a window of opportunity play a game of Tetris involving scrapbook pages, page protectors and albums. I’m down to just twenty-three layouts left, which may sound a little ridiculous, but they shall each have a home this evening and for at least a day I shall feel like a scrapbooking Tetris champion. Hurrah! I know we all have our own systems that work for us, and I would love to hear how you organise your pages. 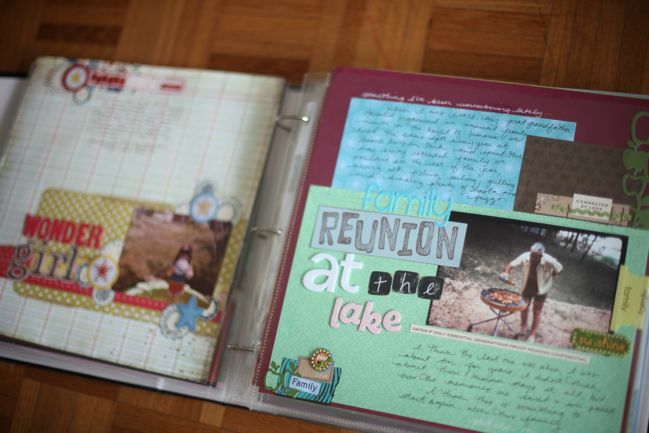 I have to admit, I think I have it easy for organising pages since it’s just the two of us – no trying to figure out what goes into a family album versus albums for individual members of the family. But I do have a system for what goes where. Most of my albums are 12×12 three ring binders with black fabric covers. (Specifically, I use these by American Crafts.) Each year gets a general album. It’s called ‘Our Lives’, which is completely hokey but simple enough that I just stuck with it. All the day to day stuff and events from the year goes in that album, in chronological order – though I don’t make the pages in chronological order at all. When an album gets too full, I just start another album for that year, call it volume two and keep the story going in date order. That’s part of why I love three ring binders: because it’s so easy to move the page protectors from one book to another. Some times there are events that were just too photogenic and I end up with an inordinate number of pictures, so if I scrap quite a few of them, they will make the everyday Our Lives album for that year look totally silly. Case in point: SJ’s tea party last summer: I’ve probably made twenty different pages about that day, and three other layouts for the rest of that entire month. So if I included all those pages in chronological order, you’d pretty much think we did nothing else last summer except dress as Alice and the Mad Hatter. So events like that actually get their own album. I don’t plan it from the outset or anything – I never set out making all those pages thinking I wanted an entire album of Wonderland. I just enjoyed scrapping those pictures to the point that I ended up with a big stack of layouts that would fill an album on their own. It’s like promoting an event from the everyday to the something special. Those events also give me an excuse to use something prettier than a black fabric album. I love the different patterned albums from the same range, so I pick a different pattern for each of those special events. I have two from 2010, one from 2009 and one from 2008 – though admittedly 2008’s is our wedding album, so I always assumed that would have enough pages to make its own album (or two or three). Then there are red albums – and those are for trips. If we go somewhere and I only do a few pages, then it stays in the black album at the right point in the calendar. If it’s a big trip and has enough pages to be promoted, then it gets its own red album. The earliest trip I did this for was 2006, when we went to Iceland. Since then we have travel albums for the Pacific Northwest in 2007, our honeymoon in 2008, a family trip to Cornwall and our holiday to Hawaii in 2009, and then the start of the big 2010-2011 journey, which will need several volumes. Within each album, everything is pretty much in chronological order, from the beginning of the trip to coming home again. Sometimes I add extra perspective pages at the end of an album, like if I’ve been thinking of a place a year later or something in the news has made me think of a certain memory and sometimes I’ll close the album with a sort of top-ten list about what we loved about a particular trip, which tends to summarise everything that is there in chronological order. …moved the albums from on top of the bookcase to the bottom of the bookcase. I am short and couldn’t get to them without a chair! As a result, I would just let the layouts stack up instead of putting them away. …added labels. I love that all our albums are very uniform, but I didn’t have them marked. And because I scrap out of order, I would pull four or five different books until I found the right one. Clearly that was daft. So I went for a very popular option – circle tags stuck on the spines. I had plenty of those and they aren’t going to disappear from the world like a collection that gets discontinued after a year. The labels make it so much easier to see exactly the right album, so I’m hoping that means I will put pages away rather than waiting until the job because a big chore. …made it easy to get to page protectors of all sizes. I keep pages of all sizes together in 12×12 albums. And I had a storage spot for page protectors. Except it was a spot that was a pain in the neck to get to, so again, I would put it off. Seriously, how difficult was I trying to make this? So I’ve moved them all to somewhere easy and I added a few extra page protectors to all the albums I’m actively adding things to at the moment, so I should just be able to open the album and add the page. …got rid of the box where I stacked all my layouts waiting for a home. I had this from the days of the magazine when everything came back months later, but most of my pages are just photographed here now rather than sending them away, so I have no excuse to let pages wait months before they have a home. The box has a new purpose in another room – hurrah. …culled a handful of layouts that I didn’t like in any way and weren’t helping to tell the story. Most of those were things I did for assignments with really specific requirements and they just didn’t feel like me, and usually I had scrapped those photos again in a way I liked. …dedicated an afternoon to getting all homeless pages into the right place, in page protectors and in an order that makes me happy. There were a few things that I also patched up along the way – mostly old chipboard letters that didn’t keep their adhesive qualities or layouts I had done on either glittered or flocked cardstock and other elements just didn’t want to stick to that paper. Everything else was pretty much fine, barring the odd bent corner here and there. If all the letters were there for the chipboard, I reattached with stronger adhesive; if the letters had gone missing I replace the whole word with a different set of stickers. And things on difficult papers I just stitched with the sewing machine so they aren’t going anywhere in the future. Now I’m left with a couple things I still want to do. I would like to make a sort of summary layout for each album. Something that goes inside the album that gives an overview of what was happening. I did that when I first started scrapbooking but somehow stopped several years ago. I noticed it most in our 2004 album. That’s the oldest album I display, and it’s the year I met The Boy. The album includes the months at the beginning of the year before we met and then suddenly there’s just this new face on my pages, and there’s no real explanation. I think that would be so much more clear if I added a page at the beginning that explained 2004 was the year we met, he finished his MSC, I relearned how to drive… and maybe even mention things that are obvious to us but not to anyone else (our ages, where we lived) and some things that give perspective to the bigger life story (like our jobs). I think those pages would be quite easy to add and would help make things make sense if someone sat down with the album. So it’s a thought. 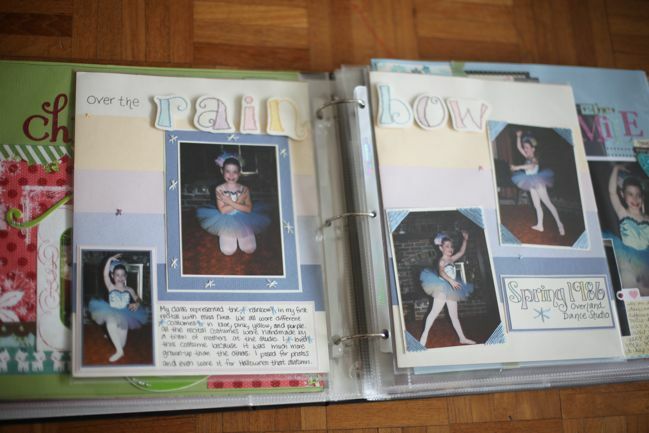 The other job on my to-do list is adding a few photo pages to each album. 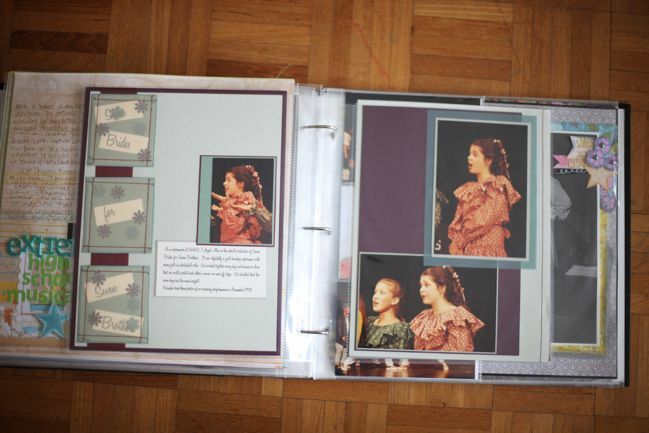 Two photo protectors in each album would include up to twenty-four more 4×6 photos without lots of bulk. And if for some reason those photos really inspire me in the future, I could always swap them out of those protectors and give them their own page, and just fill the gap with another photo, some patterned paper or more journaling. But now comes the big question: will I actually conform to my new system and get pages straight into the albums once they are finished? Give me a week and I’ll report back! So… how do you organise your pages? I would love to hear! And now I just have to wait for a guest at our house to actually ask to look at a scrapbook – because it would be safe to grab any album off the shelf! Even if it is rainy where you are, I hope you are having a lovely Sunday! PS: Don’t miss this weekend’s giveaway from Rob Ryan!